Briscoe was a quarterback in college, where he passed for 2283 yards and 25 touchdowns as a senior in 1967 and the team won the Central Intercollegiate Conference championship. He was chosen by the Denver Broncos in the 14th round of the ’68 AFL/NFL draft with the expectation that he would be a defensive back or wide receiver. But when starting QB Steve Tensi was injured early in the season, he started five games (and thus became the first African-American to start at quarterback in the AFL or NFL). Highly mobile, “The Magician” completed only 41.5 percent of his passes, but they were good for 1589 yards and a league-leading 17.1 yards per catch. He also tossed 14 TD passes and rushed for 308 yards, scoring three touchdowns and averaging 7.5 yards per attempt. With the Broncos unwilling to commit to him as a quarterback, he was released, signed by Buffalo during preseason in 1969, and shifted to wide receiver. Despite joining the team late and changing positions, he caught 32 passes for 532 yards (16.6 avg.) and scored five TDs. Bills went 3-10-1 to finish fourth in the AFC East. Briscoe followed up in 1971 with 44 catches for 603 yards (13.7 avg.) and five touchdowns. 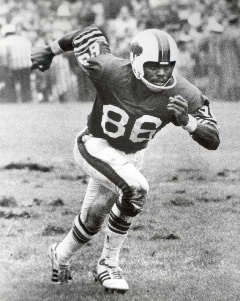 Having played out his option with the Bills, he moved on to the Miami Dolphins for 1972 and saw limited action as backup to WR Howard Twilley, catching 16 passes while the team went undefeated in winning the NFL title. Briscoe moved into the starting lineup in ’73 and had 30 receptions for 447 yards (14.9 avg.) and two TDs but appeared in only four games in 1974 and was traded, playing for the Chargers and Lions in 1975 and finishing up with New England in ’76. He never again appeared at quarterback after his rookie year, but in eight seasons as a wide receiver he caught 224 passes for 3537 yards (15.8 avg.) and 30 touchdowns, with 133 of those receptions for 2171 yards (163 avg.) and 18 TDs coming with the Bills.